Several top Democratic presidential contenders and other prominent liberals' calls to "Abolish ICE" aren't helping Democratic hopefuls in California running in the 10 most competitive House races there. All 10 of those Democratic candidates have backed away from the liberal rallying cry to dismantle Immigration and Customs Enforcement, with some voicing support for overhauling the agency and others arguing that the campaign itself demonstrates just how far off-course the Democratic Party has veered, according to a report in the San Jose Mercury News. "You don't have an infection on your toe and cut off your entire foot," Katie Hill, a Democratic nonprofit executive running against Rep. Steve Knight (R., Calif.) in a district in northern Los Angeles County. "It shows the need for more sane politicians who are committed to fighting for what needs to happen, not just rabble-rousing their base." "ICE is a scapegoat for what the president is doing from the very top of government," said Ammar Campa-Najjar, a Democrat running against Rep. Duncan Hunter (R., Calif.) in a predominantly Republican seat in northeastern San Diego County. If ICE were dissolved, he said, "Trump could come up with a different acronym for a different agency, and it would still have the same problems." Liberal groups have been pushing an "Abolish ICE" campaign ever since the beginning of Trump's presidency in response to his tougher enforcement of the nation's immigration laws. The movement has grown over the last few months in response to a flood of news stories about immigrant children being separated from their families because of Trump's "zero-tolerance" policy of prosecuting all immigrants caught crossing the border illegally, as well as other media stories about cases of immigrant abuse—many of which date back to the Obama administration. The effort gained even more momentum after far-left Democratic candidate Alexandria Ocasio-Cortez embraced the "Abolish ICE" mantra and successfully knocked off longtime Democratic Rep. Joe Crowley. Top contenders for the 2020 Democratic presidential campaign quickly voiced support, including Sens. Elizabeth Warren (D, Mass. ), Kirsten Gillibrand (D., N.Y.), and Kamala Harris (D., Calif.). Other top national Democrats, such as House Minority Leader Nancy Pelosi (D., Calif.) have been more cautious. Pelosi has called for "an immediate and fundamental overhaul" of the agency but has stopped short of saying it should be completely disbanded. 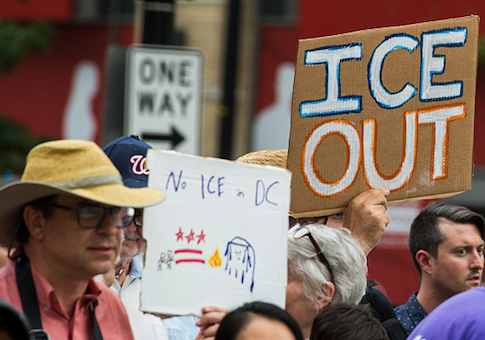 After several polls clearly showed that an overwhelming majority of Americans oppose abolishing ICE, Trump predicted that the issue is backfiring on Democrats in key seats they need to win across the country to take back the House, including those in California. Democratic candidates in California districts that have previously elected Republicans are taking the cue. Here's what the 10 Democrats running in the most competitive California House races have said about ICE, according to the Mercury News report. This entry was posted in Politics and tagged 2018 Election, ICE, Illegal Immigration, Immigration. Bookmark the permalink.